Black Forest ham is a signature dish from southern Germany, seasoned and slow-smoked with a distinctive darkened exterior. Oven-baked ham is one of those special-occasion dishes that gets everybody's mouth watering. But you can achieve similar results by preparing your Black Forest ham in the slow cooker. Since the ham is already cooked, you only have to warm it up before serving. Use the leftovers to make ham sandwiches all week, or cut it into cubes and store it in the freezer for a quick addition to casseroles, soups and stews. Place the ham into the slow cooker cut-side down. If your ham is too big to fit into the slow cooker, cut it in half and nestle the two pieces side by side. Pour 1/2 cup of liquid into the slow cooker. Plain water works fine, but opt for fruit juice or broth to infuse the ham with a punch of flavor. Add aromatics such as quartered onions, whole garlic cloves, chunks of fresh ginger or bay leaves to the liquid, if desired. Alternatively, season the liquid like you would a glaze for ham baked in the oven, using brown sugar, jams and jellies or a combination of the two. Pour in a few tablespoons of mustard, honey or chopped, dried fruit, if desired. For a spicy kick, mix in a dash of cayenne pepper or chili powder. Cover the slow cooker and set it to "Low." 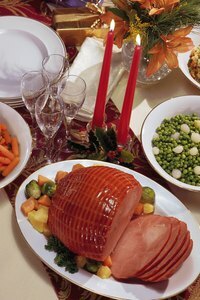 Allow the Black Forest ham to cook until the internal temperature reaches 100 degrees Fahrenheit, about 5 to 6 hours. Transfer the ham to a cutting board and allow it to rest for 15 to 20 minutes before carving.